BANGOR – From the outside, baton twirling looks effortless, but after holding a baton in my hand and trying to spin it gracefully through my fingers, I have discovered that twirling is like eating with chopsticks - it looks easy until you try it. The Central Maine Twirling Corps has been making the sport look unchallenging since 2009. Andrea Fletcher, coach and director of Central Maine Twirling Corp, has been twirling since she was seven years old and growing up in New Hampshire. Fletcher started twirling in Bangor after she was invited to assist East Coast Twirling Association Director Diane Higgins with the World of Twirl summer camp in Bangor in 2000. Four years later, Fletcher took a job in Bangor and she and Higgins began co-coaching. When Higgins retired in 2009, Fletcher became the coach and director. At that point, Fletcher founded Central Maine Twirling Corps. Today, the Central Maine Twirling Corps includes the Main-E-Acts team, Main-E-ettes team, River City Twirlers and Capital City Twirlers. The program has approximately 30 members in its core. 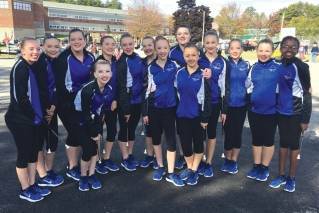 The twirlers come from all over central Maine; participants hail from Augusta, Bangor, Brewer, Bucksport, Hampden, Holden, South Paris and West Gardiner. Baton twirling is not an undistinguished sport anymore – it has definitely evolved, this according to Megan Sawyer, assistant coach at the Central Maine Twirling Corps. The Main-E-Acts team shows the world that twirling is a combination of grace and power. That team is the group of twirlers from the Central Maine Twirling Corps that practices baton twirling at its highly evolved level. They serve as the travel component of the Central Maine Twirling Corps program. The team consists of 15 women, ages 10 to 18. “Main-E-Acts are twirlers that show extreme dedication to the sport,” said Sawyer. The Main-E-Acts team was created in 2004 as the travel component of the then-umbrella program World of Twirl. The original members were selected by Diane Higgins for their outstanding twirling and dancing abilities as well as their enthusiasm, dedication and passion for the sport of baton twirling - and these qualities are still sought in today’s team members. The Main-E-Acts twirlers travel to regional and national competitions; they also twirl at local parades, fairs and celebrations. In 2009 and 2015, the Main-E-Acts performed in the National Cherry Blossom Festival Parade in Washington, DC, and in 2010 the group entertained in the 249th New York City St. Patrick’s Day Parade in New York City. So while I may look like a fumbling idiot with a baton in my hand, these girls make the sport seem fluid and natural. For more information or to register for baton twirling classes, go to www.centralmainetwirling.com.